Axinite is an interesting mineral and produces unique flattened spatula shaped crystals that fanciers of well formed crystals love to collect. It is a triclinic mineral which means that it has no symmetry planes or axes of rotation. It does possess a center of symmetry. A center of symmetry, or center, is a symmetry operation that takes a face on one side of a crystal and inverts in through the center of the crystal to the other side. The faces that are inverted are completely flipped both left to right and up to down. With this being the only symmetry operation, faces on axinite crystals are seemingly scattered everywhere and anywhere (except for their inverted partners on the other side of the crystal). Manganaxinite is found at Franklin, New Jersey and is special due to a red fluorescence that is not seen in the other axinites and an attractive yellow-orange color. All axinites can have a one-of-a-kind color and crystal habit and a very nice luster that make them popular for collectors that like a different kind of crystal shape. Color is commonly a lilac brown but also yellow, yellow-orange, gray, pale blue and even black. 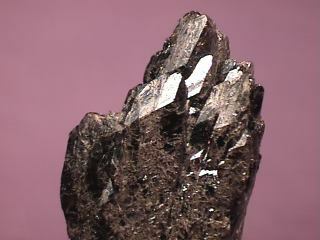 Crystal Habits include flattened wedge shaped crystals, often with a spatula or knife-like shaped edge. Also as granular and as parallel bladed aggregates. Other Characteristics: crystals are heavily striated on some faces and manganese rich axinites have been known to be fluorescent red. Associated Minerals are diopside, andradite, quartz, calcite, epidote, scheelite and prehnite. Notable Occurrences include Madera Co., California and Franklin, New Jersey, USA; Baja California, Mexico; Bahia, Brazil; Switzerland; Obira, Japan; Cornwall, England and France. Best Field Indicators are crystal habit, hardness, color and striations.